Tobacco use is known to cause several illnesses, including various forms of cancer. The most common and well-known is lung cancer; however smoking tobacco can also lead to dangerous interactions with other toxins that can harm the lungs, like asbestos. Through dual exposure, this can lead to increased risk of developing serious health conditions. Inhalation of asbestos fibres can cause irritation and scarring that can potentially lead to tumours and cancer. 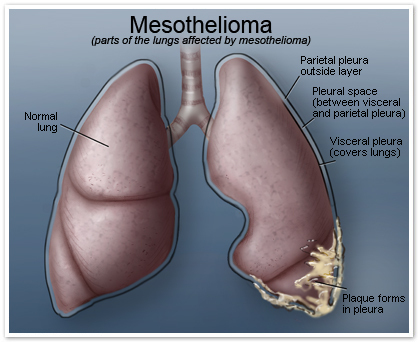 It is known to cause several lung diseases, from asbestosis and lung cancer to a rare cancer called mesothelioma. The most common form is pleural mesothelioma, which occurs when tumours form in the pleura, a thin membrane of cells that lines the lungs and chest wall. While exposure to asbestos is the only known cause of mesothelioma, exposure to other toxins from smoking can make a person more susceptible to the disease. Studies have shown the likelihood of developing mesothelioma and other asbestos-related diseases increases anywhere from 50 to 80 percent for those who have been exposed to asbestos and also smoke, compared to non-smokers. Increased mucus caused by smoking further interferes with the body’s ability to clean the lungs of irritants and maintain healthy lung tissue. The dangerous interactions that smoking can have with other toxins are another reason why smoking should be avoided.